Home » Reviews » How to Choose External Hard Drive? 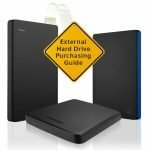 How to Choose External Hard Drive? Today we will take a closer look on how to choose the external hard drive for your computer, laptop or tablet. We’ll explain basic things that will help you to make the correct choice and according to your needs. Understanding of which external hard drive is better for your case and why, you need to determine the list of parameters for comparison. What Do You Need to Know to Choose an External Hard Drive? The first thing you need to do is to pay attention to the drive’s capacity. How many gigabytes do you need for happiness? No one, except yourself, might tell you how much disk is better to take. If you are not collecting your favorite music in FLAC and not shooting video in 4K resolution, then such 500 GB drives as Western Digital Elements Portable, Seagate Expansion 500 Gb and Transcend StoreJet should satisfy you. For those who need to store a lot of high resolution videos, many necessary programs, music and photos in RAW format etc. manufacturers proposing larger disks. For example, on 1 TB like HGST Touro S and Western Digital Portable or even 2 TB models like Western Digital My Passport Ultra or Seagate Expansion 2TB. The form factor determines the size of the disk. Once upon a time there were no specialized external storage devices — in fact, regular disks were used. They were installed in a container with external power — that’s what turned out to be a portable device. Therefore, the names of the form factors remained the same: 2.5″/ 3.5″. Later, an even more compact version of 1.8″ was added. Thunderbolt works through a specific connector for Apple computers. Transmission speed up to 10 Gb/s, but incompatibility with the more common types of connectors severely limits the scope of its use. External drives can be produced as a traditional memory on spinning disk (HDD), so as a more modern solid state drive (SSD). Also on the market there are combined systems in which fast SSD is used for caching, and the HDD part is for long-term storage of information. Hybrid HDD + SSD (SSHD) are rare. Hybrid is designed to combine the advantages of the two listed above devices in one. At first glance, all external hard drives are rectangular and there are no important differences. But if you’ll take a closer look, some of them are more compact and thinner. Usually such models have word “Slim” in the title. 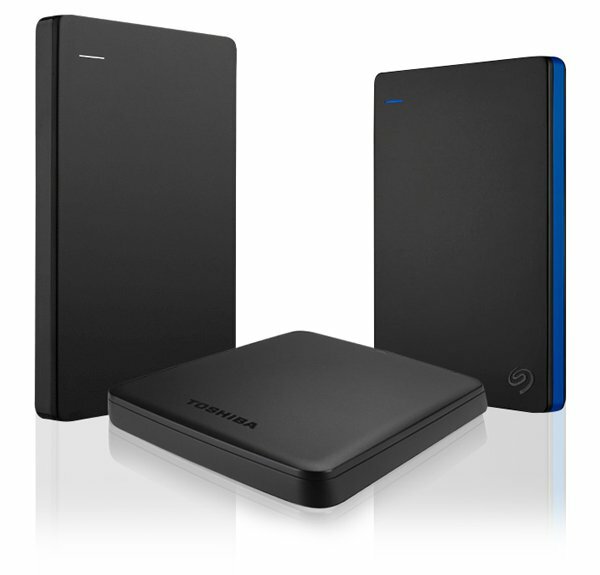 For example, a good choice is Seagate Backup Plus Slim 1TB Portable USB 3.0. The buffer is a small amount of faster memory that speeds up the disk. In most models, its value ranges from 8 to 64 megabytes. The higher the value, the faster the work with the disk. So we recommend you target at least 32 megabytes. Since the hard drive itself is a mechanical and fragile device, it is natural that some companies produce models in protective boxes. For example, the Transcend StoreJet M3 Military Drop and the Transcend Military Drop Tested H3 are protected against attacks with US Army drop standards U.S MIL-STD-810G 516.6 — the hull design has received three stages of impact protection, an anti-slip rubber case and a high-tech internal hard drive suspension mechanism. The emergence of wireless external hard drives was expected. These devices deploy a Wi-Fi network around themselves and allow you to stream media and files to any other device — computer, smartphone or tablet. Seagate Wireless Plus, for example, allows you to connect up to 7 different devices and supports Apple TV, AirPlay, Samsung SMART TV and DLNA. This disk can work not only from the network, but also from the battery. The charge is usually enough for up to 10 hours. Western Digital My Passport Wireless is another representative of wireless external hard drives. Up to eight devices can be connected to it. In addition, this one has a slot for SD, SDHC and SDXC memory cards, which allows you to quickly and conveniently transfer pictures and videos from the camera. Now you see that a huge mass of external hard drives can be confidently classified. For those who need to keep a place in the purse, there are ultra-thin models. If you want to always carry a hard drive with you and be sure of the safety of the data, then you should choose protected from the blows.